How to convert PCL to PXL and rotate the page? 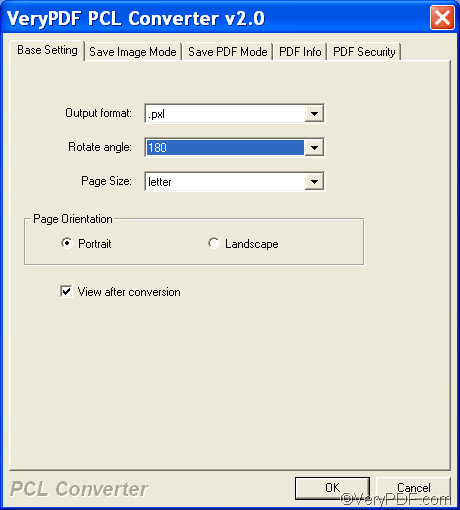 With the help of VeryPDF PCL Converter, you can quickly convert PCL to PXL and rotate the page. As a matter of fact, it can convert PCL to PXL, PS, TIF, TIFF, JPG, JPEG, BMP, PCX, or PDF without any third party product. 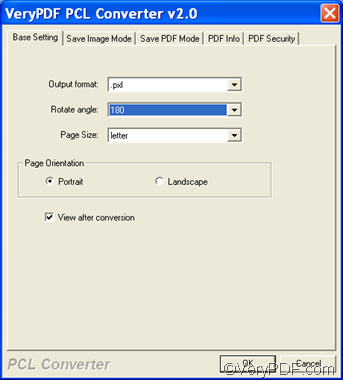 VeryPDF PCL Converter is an easy to use application, which only requires four steps to convert PCL to PXL and rotate the page. Please follow the steps below and try to use VeryPDF PCL Converter to solve your problem. Firstly, please run VeryPDF PCL Converter by double clicking its icon on the desktop. Secondly, please add the PCL files by dragging and dropping them from the Windows Explore to the list box of the main interface of VeryPDF PCL Converter. Thirdly, please set options. After you click the Setting button under the list box, you will see a dialog box as follows. There you can select options to set PXL as the output format and rotate the page. To set output format, please click on the arrow on the right side of the Output format combo box, and select .pxl from the drop-down list. To rotate the page, you should click on the arrow on the right side of the Rotate angle combo box, and then in the list, please specify 90,180, or 270 as the angle. If you like, you can also click the tabs like Save Image Mode to switch to the other tab controls and select other options like color depth and resolution. After setting options to meet your needs, please click OK and proceed to the next step. Fourthly, please click the Start button. A dialog box will pop out, and you can browse folders or create a folder as the output folder, and then click OK to start conversion. The process bar at the bottom of the interface can show you the process of conversion. Normally, after conversion, the computer will open the result files by default. If you don’t want to view them after conversion, you should go back to the third step, and click on the check box preceding View after conversion. How to convert PCL to PXL and fit to paper size? How to convert PRN to JPG and rotate the page? This entry was posted in VeryPDF Blog and tagged pcl to pxl, rotate the page. Bookmark the permalink.